Gestures are simple inputs that can control nearly any feature or function of your iPad and with a little bit of training they can become an incredibly useful tool. Unfortunately very few users know about iPad gestures and don’t ever get to experience just how useful they can be. Fortunately this short how to guide should help you understand the basic principles and controls of the various iPad gestures. 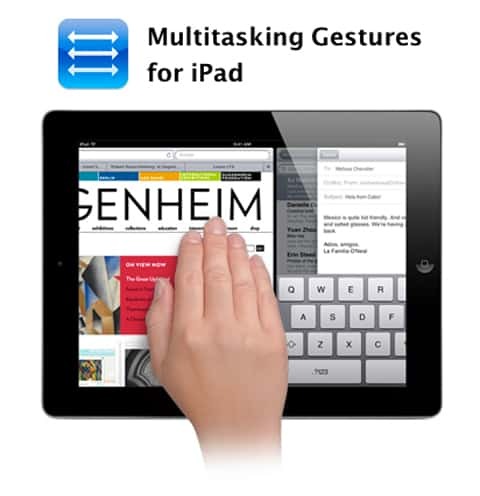 The first thing you need to do is actually enable gestures on your iPad. This is done through the options menu as long as you’ve got an iPad 2. If you have an original iPad then unfortunately you will have to purchase an additional app to enable iPad gestures. Once gestures are enabled all you have to do is start using them. Swiping with 4 or 5 fingers across the screen is one of the most common gestures that will automatically bring up the multitasking menu; this gives you quick and easy access to all of your running apps. Swiping left or right will quickly and easily move you from app to app; this gesture alone can save you dozens of finger presses when changing apps because you no longer need to return to the home screen. READ How to Get Free Apps on iPhone? Other gestures are configurable through iOS or other apps so if you’re looking for something make sure to do a quick search. These gestures are quite handy and should definitely be used by anyone that frequently uses an iPad because they are truly a lot more convenient than manually changing between programs or the home screen. Try them out today and see how much iPad gestures can improve your iPad experience. Unfortunately these gestures are not yet available for the iPhone though.